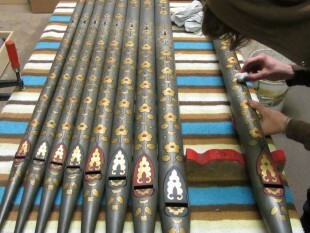 We are currently restoring the 1864 Bevington organ made for Philip Yorke at Erddig near Wrexham in Wales. Erddig is a National Trust house, famous for the consideration which the family showed for their servants and workers, with series of portraits and little verses of poetry for each. The Bevington organ stands in the entrance hall, which doubles as a music room. It is very nicely made, as Bevington organs were, retaining some of the bloom of the classical 18th century organ after other Victorian organ builders had opted for a bigger, but duller sound. The front pipes have a characteristic ribbed pattern on the outside surface, for which they must have had a special casting bed.